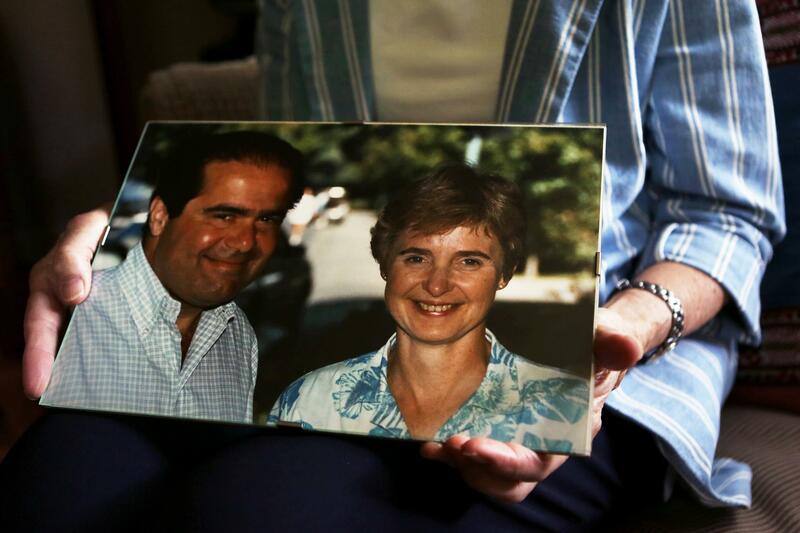 In a sunny den in McLean, Va., Maureen and Christopher Scalia sit side-by-side on a comfy couch. He co-edited Scalia Speaks, an anthology of his father's speeches on a variety of subjects, and he ranks eighth in birth order out of the nine Scalia children. She is the mother of those nine children, and the widow of the late Supreme Court Justice Antonin Scalia — a conservative icon, bon vivant, music lover and witty observer of law and life. Christopher explains that he put together the collection to give non-lawyers, as well as lawyers, a fuller picture of his father and his many interests. The book's foreword is written by Scalia's close friend, Justice Ruth Bader Ginsburg, with whom he disagreed — often vehemently. As Ginsburg observes, at George Washington University in 2015.